WITH traffic congestion in the country seemingly getting worse, and generally poor public transport systems, calls for a scrapping policy are getting louder, especially from the auto industry. As at end-December 2013, Malaysia had a total of 23.7 million registered vehicles — 11 million motorcycles, 10.5 million cars and 2.2 million commercial vehicles — which is a lot for a population of about 30 million. “We acknowledge that efforts have been made to improve public transport, like the MRT and LRT,” says Malaysian Automotive Association (MAA) president Datuk Aishah Ahmad. “However, the MRT and LRT lines are not extensive and would not be able to cover many areas. Moreover, these projects are mostly confined to the Klang Valley. Hence, people will continue to buy cars … it is no longer a luxury item but a necessity for most of us,” she says. In March 2009, as part of a RM60 billion second economic stimulus package to help Malaysia through the global economic crisis, RM200 million was set aside as part of the Automotive Development Fund, which in turn, introduced the scrapping of vehicles that were more than 10 years old. Under this plan, the government offered a RM5,000 discount to car owners willing to scrap their cars and acquire either a Proton or Perodua vehicle. This was intended to stimulate car sales and take some of the older cars off the roads to ease congestion. 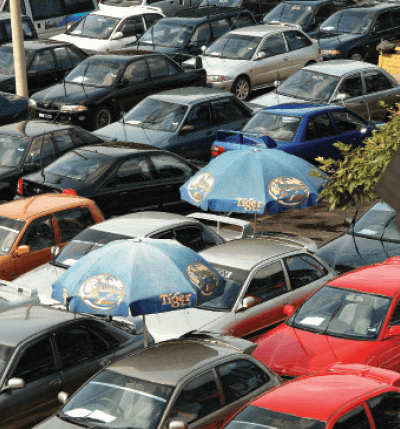 According to the president of the Federation of Motor and Credit Companies Association of Malaysia (FMCCAM), Datuk Tony Khor, the scrapping scheme was a success. National automaker Proton Holdings Bhd had in 2007 initiated a similar scheme, Proton XChange, where cars over 10 years old could be traded in for RM5,000 to get a new Proton car. This was later merged with the government’s scrapping initiative, which was however, discontinued in October 2010 after funds from the government dried up. Proton received a total of 25,862 applications from March 10 to Oct 31 in 2009, fully utilising the funds from the government. At RM5,000 per car, 40,000 cars could be scrapped with the RM200 million budget. Most auto players, not surprisingly, support scrapping, including SM Nasarudin SM Nasimuddin, joint executive chairman of the Naza group. “Scrapping is indeed key in any developing or developed nation. It serves as a catalyst for new car sales. I’m not a pessimist but as long as global conditions don’t improve and forex is against us, it will be challenging,” he says of the current scenario. So, the time could be right to introduce scrapping. Auto sales in August fell by close to 9% to 53,452 units, while 434,282 vehicles were sold year to date — a drop of 10,268 automobiles, or 2.3% less than the corresponding period last year. MAA has trimmed its total industry volume (TIV) forecast by 10,000 cars to 670,000. Some analysts are less confident, seeing a TIV of 650,000 units. Khor of FMCCAM says he had proposed a voluntary vehicle scrapping policy for cars above 15 years old, with the government and manufacturer to offer RM5,000 as an incentive for a trade-in for all CKD (completely knocked down) cars. To date, there has been no response, he says. The MAA too had “proposed many times to the government to introduce a long-term auto-scrapping scheme, for all makes and models”, says Aishah. She says there should be a scheme for cars above a certain age to be scrapped, with guidelines set by the government under a vehicle scrapping policy. Before that can be done however, it is important to iron out all relevant issues, such as logistics and documentation, to ensure the scheme is acceptable to all stakeholders. In a nutshell, scrapping provides the auto industry with an exit strategy, and is something that should have been done earlier — before the industry was maturing. The auto sector is a multi-billion ringgit industry, with thousands of jobs dependent on it. As such, it would make sense for the government to assist in boosting local demand for cars. Aishah says there are 40 brands of passenger as well as commercial vehicles in the Malaysian market, an indication of the strong growth of the industry over the years. Increasing competition will drive car companies to offer greater choices, better products and services to attract consumers. Government policies, especially taxes, affect the cost of a vehicle, especially excise duty, which ranges from 65% to 105%, she says. 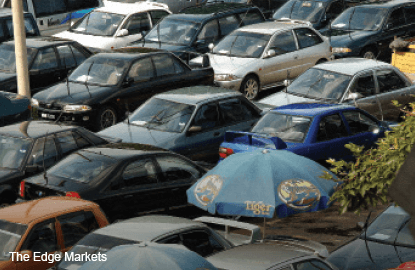 “We hope the government can consider reducing the excise duty or Goods and Services Tax partially so as to help to boost demand for new motor vehicles,” she says. Nasarudin says apart from scrapping, there are several other ways the government can assist the industry. “The lending criteria could be relaxed a little, or perhaps pushing the energy-efficient vehicle (EEV) agenda. The possibility of offering direct tax incentives to individuals and corporations that purchase diesel and other EEV vehicles could be considered ... such as tax-free imports of diesel-powered vehicles. A similar measure was accorded to hybrid cars a few years ago,” he says. Khor suggests that the government urge financial institutions to be more flexible on loan approvals. “Used car loan applications have a 50% rejection rate, and new cars, 47%. If the banks can be a little more flexible, it will help us,” he says.